This article was submitted in August 2008 as a "Donauschwaben Issue" for discussion purposes. A new program of the Slovenian government has recently been illuminating the secret, literally buried legacy of mass slaughter in Slovenia after the end of WWII. In forests throughout Slovenia in areas like Lancovo, Celje and Tezno, mass graves are being registered and revealed to researchers in record number as Slovenians begin to come forward with information and acknowledge the shameful existence of these tragic sites. Quietly known for years - local farmers keeping their livestock from grazing in their vicinity, medical students occasionally visiting the sites when needing skulls or bones for their studies - the elderly have still been too fearful of reprisals to openly speak about their existence. Joze Dezman, a historian who heads the committee for registering hidden graves, says "People who come to me are still afraid someone will see them talking to me. They have fear in their bones." There is no small amount of irony to this fear, considering the nature and circumstance of these massacres, which were reprisals themselves. Many of those killed were soldiers who fought in collaboration with Nazi Germany - victims of what is widely acknowledged as a vengeful killing spree by partisans of Tito's victorious communist party which came to power in 1945 in the aftermath of World War II. These crimes are unique in the history of the war. Not only were they carried out by the home resistance to Nazi Germany, but they occurred after the war's end: In the two months following the end of WWII, more people were slain in Slovenia than during the four years of the war. "These killings took place in Slovenia because this is where the war was ending: this is where the Iron Curtain was anticipated, this is where refugees found themselves at the end of the war," Dezman says. When WWII began, the Republic of Slovenia was partitioned between the Axis Powers, with different regions absorbed by Italy, Germany and Hungary and subsequently ethnically cleansed. Slovenia became part of the Axis Powers. By the war's end, Slovenia was essentially in a state of civil war with conflict between Nazis and partisans and in-fighting between communist and anti-communist parties. When British-led Allied troops turned Balkan soldiers back from Austria at the end of the war, they were turned over to the communist partisans who now controlled the volatile region. The soldiers were then summarily murdered in forests throughout Slovenia without trial. However these mass graves do not simply harbor the victims of revenge killings; many of the victims were members of opposition parties killed by the communists to lessen the threat of counter-revolution. Despite the fact that Slovenia declared independence from Yugoslavia in 1991 and is now an EU member country (about to hold the EU Presidency, no less), the graves have remained a public secret for for decades. Yugoslavia's communist authorities diligently refused to acknowledge the killings and refused to tell relatives where the bodies were buried. For 50 years the graves were forbidden to visitors. Many of them were even destroyed by deliberate explosions, covered by mountains of waste, or in the case of Celje (60km east of Ljubljana), parts of town were built over them. Although the graves were known to exist, their exact number was and is still unknown. "It is high time to acknowledge these graves - after all, more than 60 years have passed since the Second World War," said Lado Erzen, the local representative for secret graves in Lancovo. In 2002, 40 mass graves had been registered in Slovenia. Researchers had no idea how many more would soon be revealed to them: "Only after we started researching the first graves did we realize how many secret graves there were, as people started to open up, calling us and telling us of locations they knew of," Mitja Ferenc, chief historian in charge of grave research, said. In August, researchers confirmed at least 15,000 victims in a secret mass grave in Tezno, about 120 kilometers northeast of Ljubljana, where mostly Croat and Montenegrin soldiers were slain and buried. As of October 2007, 540 secret mass graves had been registered across Slovenia, believed to be holding up to 100,000 bodies. Slovenians account for only one-fifth of those victims. Thus far, no one has been charged or brought to trial in connection to the crimes. 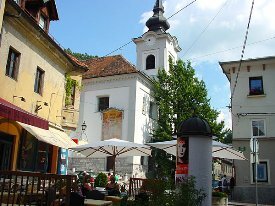 Ljubljana, with around 280,000 inhabitants, most certainly ranks among the smaller European capitals. Prevailing local legend claims the Greek hero Jason and his merry men, the Argonauts, as the founders of Ljubljana. Upon stealing the golden fleece from King Aetes, Jason and the lads fled across the Black Sea, sailing up the Danube, Sava and Ljubljanica rivers, before stopping at a large lake near the source of the Ljubljanica. Here, whilst dismantling their ship which they planned to cunningly carry in pieces across to the Adriatic Sea, lo and behold, they discovered a monster (as tends to happen in Greek myths). Jason swiftly engaged the creature in battle (as mythological heroes tend to do) and destroyed it (likewise). 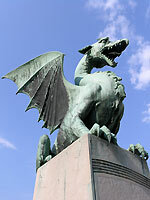 The creature became known as the Ljubljana Dragon and is today the symbol of the city and a feature of the city crest.